Leopard Print Ruffle Sleeve V Neck Dress is rated 4.3 out of 5 by 15. With animal prints dominating catwalks this season you'll be sure to look on trend with this beautiful ruffle sleeve dress. Also a key focus this season, ruffles are totally on-trend right now and this detail to the sleeve helps create a really chic finish. 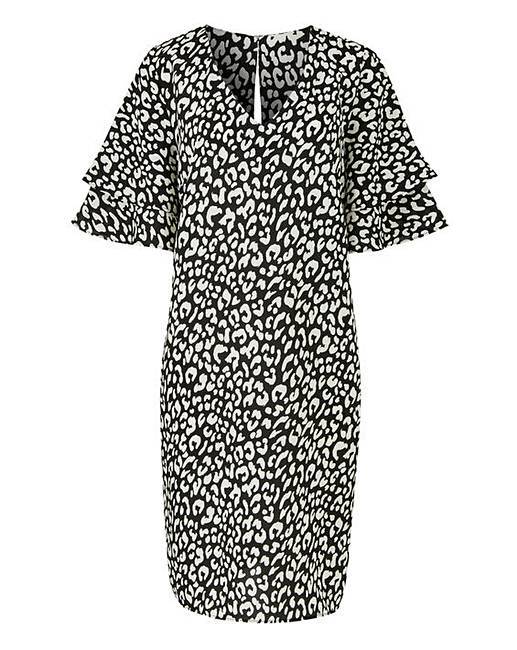 Cut to a flattering shift shape, this dress is adorned in a stylish black animal print and can be styled up or dressed down easily to match the occasion. But, for an elegant and fashionable look that's sure to turn heads, team with a pair of heeled ankle boots and layer on the lip-gloss! Rated 5 out of 5 by Foxylady10 from Simply stunning I bought this and so glad I did ,it looks great dressed up with heels or casual with a denim jacket.It looks more expensive than it was great value. Rated 1 out of 5 by Suse from Shapeless I ordered this in a size 10 but it was huge and shapeless. Nice material but very unflattering. Rated 5 out of 5 by Mrs B from Looks great Great buy very versatile. Looks good, can wear with leggings, tights or bare legs and sandals or boots. Easy care fabric so great to take on holiday. Rated 5 out of 5 by Nickypix from This'll make you purr! Flattering, comfortable dress which sits above the knee. Looks beautiful on. Rated 5 out of 5 by Suzie from Lovely dress This is a lovely dress feels and fits great. Im given lots of great compliments when i wear it.